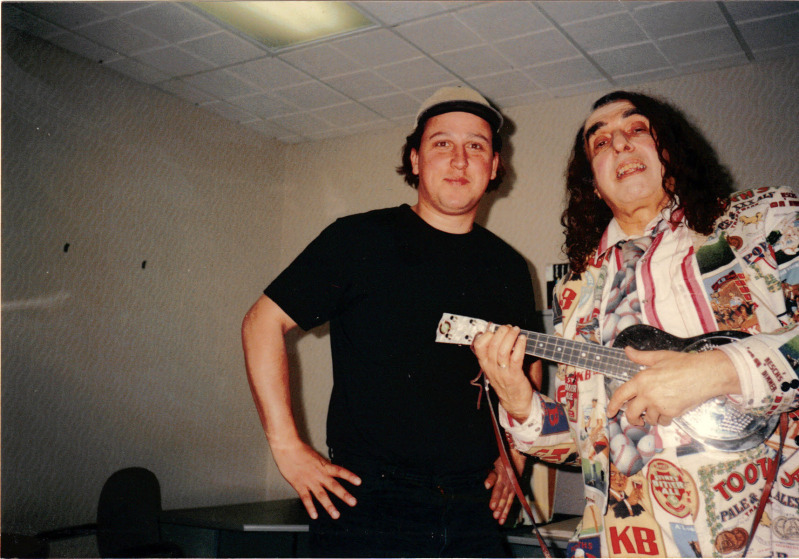 I did an interview with Tiny Tim for CUPS Magazine a few months before he died. I drove out to Laughlin Nevada to meet him, and it was one of the most bizarre events in my life. He was playing in one of those retro sixties shows with some guys from Badfinger. We spoke for an hour in the casino office. Then we went up to this hotel room, and he gave me some orange juice. Many indie labels started releasing records by him. Love Me, Girl, and Prisoner of Love. What prompted this? started it, God rest his soul. The Girl album was done in 1988 in Denton, Texas. recorded a better one than this one. You've had a low profile since the early ’70s? two years. After that the fickle public wants something new. me, "What's wrong with him?" and "What is going on here?" What's this Tiny Tim thing all about? employees sing for us. I sang a song called, "Never." I was uptight and I bombed out. Right after Christmas something had to change. You needed a way to stand out? appeal to women. Certain women who fit into my princess dream world. What sort of women are these? used Pawns from Woolworths. Landers cream from Woolworths 25 cents. That sounds kind of fruity. fag." It was worth it when one makes it. Originality is the key to success. marriage. Unfortunately, I'm no saint. You've touched women outside marriage? How many trophies are we talking about? called Mrs. Snookie. I worked in New York in a club called The Page Three. Police closed it because girls liked each other that went to that club. a miracle because at that time I sounded like everybody else. Where'd the high voice come from? happened to your other voice?" someone. They would get up and leave. I notice you are a follower of Jesus Christ. most important thing was to get to heaven. work harder and harder all the time. So you think the competition is thick to get to heaven? uncountable. We'll see the great stars and singers of King Arthur's court. with a 15-year-old girl if her parents said it was okay. We could set you up with somebody. unrest with Israel, England, and this thing with China. TT: Oh, the beginning of the end times. Are they related to Jesus Christ, the aliens? Was he an alien? Why do you think it will happen? classified me as 4G which means if they bomb New York City we'll call you. banishment to the Garden of Eden will only apply to earth or to the whole universe. I think it will apply to the whole universe. Will the aliens be subject to Christ? be the same God of Israel through Jesus Christ. A lot of people see you as a novelty act. How do you see yourself? is the only one to stand up against abortion which is the murder of a life. Have you ever used a condom? man is diminishing. The quota is getting lopsided. offers the false lie of overpopulation in China. I'm for life on every planet. So Planned Parenthood is part of Satan? TT: In my opinion, yes. Are you sick of playing "Tiptoe Through the Tulips?" TT: I never yield to the tiredness. Never bite the hand that feeds you. How many Top 40 songs did you have? 1968. One disc jockey who went on strike didn't want to play it. TT: He thought it was too odd. It blew his mind. TT: Miss Vicki. She was 17-years old and I was near 40. TT: Age does not matter. A person knows as much at 17 as they do at 47. Whose idea was it to get married on TV? her on his show. It would make her mother happy and save the expenses. How is your latest marriage going? enter her. The album has sold a thousand copies in two years.